Is the Russian MOD having second thoughts about modernizing Kirov-class CGN Petr Velikiy? Or its sole aircraft carrier Admiral Kuznetsov? What about Kirov-class CGN Admiral Nakhimov already in the modernization process at Sevmash? OSK President Aleksey Rakhmanov himself raised the issue in a recent interview, according to a recap by Militaryparitet.com. Militaryparitet cites Vpk-news.ru (currently launching a Trojan called Web Attack: Venom Activity 3 blocked by Norton thankfully). Vpk-news referred to TASS, which itself indicated Rakhmanov’s statements came on Ekho Moskvy. In any event, the original transcript of his remarks has eluded your author. As Militaryparitet puts it, the efficacy of repairing old, large surface ships like Petr Velikiy and Kuznetsov isn’t obvious. According to Vpk-news.ru, Rakhmanov feels contemporary approaches toward shipbuilding should take into account “economically justifiable” repairs and use of each ship and vessel. Of course, OSK and its enterprises make money off repairs, modernization, and construction, but the conglomerate makes more off — and is therefore more interested in — building new ships. For its part, MOD wonders if it can fund expensive construction projects, and whether OSK and Russia’s shipbuilding industry can actually deliver the new ships. It’s interesting that there isn’t the same level of angst when it comes to modernizing older nuclear-powered submarines and not as much — although clearly a certain amount — in the case of building new ones. The real worry sets in when major surface forces are considered. But it all comes down to this: building and maintaining a navy is an expensive proposition. The photo above appears to be Kirov-class CGN Admiral Nakhimov (ex-Kalinin) having its superstructure dismantled at Sevmash. Topwar.ru didn’t indicate how it came by the picture. Blogger Aleksandr Shishkin recently offered his rationale (and that of other navy advocates) for repairing and modernizing Admiral Nakhimov. As a shipbuilder, Shishkin says the “enemies of these monster-ships” think that the extraordinary expenditures required to renovate Nakhimov could be redirected to better use for the Russian military. But he contends that Russia’s nuclear-powered guided missile cruisers have a disproportionate military-political effect when compared to other ways of spending this part of the MOD budget. First, he makes a military firepower argument. He argues that Nakhimov provides more “bang for the ruble” measured against new surface combatant construction. He offers as an example the proyekt 20380 Steregushchiy-class corvettes of which five, with a total of 100 missiles, can be bought for Nakhimov’s price. Two and one-half proyekt 22350 Gorshkov-class frigates can be bought for Nakhimov’s price. Three Gorshkovs have 144 missiles. Or, for the cost of Nakhimov, one future proyekt 23560 (Lider) destroyer with approximately 136 launchers could be bought. Shishkin projects 304 missiles on the renovated Nakhimov — 224 SAMs and 80 cruise missiles. Second, Shishkin argues for Nakhimov’s political effect. Its return will keep Russia in a “firm second place” in the world navy “table of ranks” which carries a psychological impact “no one should underrate.” Showing the flag promotes Russia as an alternative to the U.S. as the world’s lone superpower, according to him. Nakhimov or no Nakhimov, many would argue China is the world’s second-ranked navy. 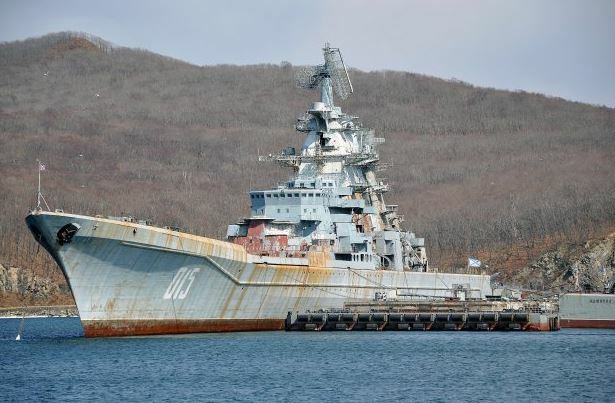 Third, the blogger maintains that reconstructing Nakhimov raises Russia’s “sense of self-worth” by showing that it can build [or rebuild] really large ships, not just patrol boats. Fourth, he asserts that Nakhimov will be ready (2018-2019) earlier than new corvettes, frigates, and destroyers that won’t be delivered until the early 2020s. Fifth, Shishkin says Sevmash’s work on a “first-rank” nuclear-powered ship like Nakhimov will prepare it to build aircraft carriers or to compete with Northern Wharf for destroyer contracts. Shishkin notes that the renovation of Nakhimov costs 50 billion rubles ($1 billion), or 30 billion ($600 million) for the ship and 20 billion ($400 million) for new armaments and systems. If this is the case, that makes Steregushchiys about $200 million, Gorshkovs about $400 million, and Liders about $1 billion per unit. So none of this comes cheaply. It’d be interesting to read an argument for Admiral Nakhimov addressing how the ship will figure in future Russian fleet operations and larger military strategy. How will it operate in defense of Moscow’s naval strategic nuclear forces, or in more likely contingencies short of this? Admiral Ushakov and Admiral Lazarev remain in reserve in different states of decay and are very unlikely candidates for modernization. Petr Velikiy will, at some future point, probably undergo the work currently being done to Nakhimov. According to TsAMTO, the press-service of OAO Concern PVO ‘Almaz-Antey’ says the firm will sell supplemental stock this month, and some of the extra working capital will be used to finance construction of two new surface-to-air missile assembly plants. Hat tip to VPK.name for highlighting the story. Specifically, Almaz-Antey intends to spend more than 3.5 billion rubles to finance the new factories. Four and a half billion rubles in federal budget money was already allocated to this effort in 2010 in exchange for additional government shares in the company. And Almaz-Antey is also using government-backed credit in the expansion. The assembly facilities will be in Nizhniy Novgorod and Kirov. They are supposed to be complete in 2015.